A gang that launched a vicious acid attack on a group of strangers in Dalston last May, and shouted homophobic slurs as they fled the scene, were sentenced at Wood Green Crown Court last week. The men, some of whom live in Hackney, were handed prison terms ranging from 17 years to 18 months for what police describe as a “relentless and sustained wave of violence”. CCTV footage of the unprovoked attack, which helped secure the convictions, was released after sentencing. The cameras helped police pinpoint three Hackney men, 24-year-old Huseyin Onel, 30-year-old Mehmet Tekagac and Onur Ardic, 27, who were involved in spraying acid during the attack. They were sentenced to 17 years, 14-and-a-half years and 14 years in prison respectively. The incident started in the early hours of 5 May 2018 with an argument between a man, who police have never identified, and one of the gang, who were sitting in cars on Alvington Crescent. The man was quickly surrounded by the nine men, who launched a ferocious attack. A group of people who had left a nearby club tried to intervene, with one of them – a man in his 20s – filming the assault. The gang took exception to this and attacked the man, kicking him to the ground and attempting to steal his phone. The victim’s friends went to help him and a large brawl erupted. During this, Huseyin Onel entered one of the cars and was seen exiting a couple of seconds later carrying a white bottle. He used this bottle to spray a noxious substance in the faces of a number of people. Realising what was happening, the victims began to flee but, according to police, Onel calmly targeted them as they ran away. Meanwhile, the vicious assault on the man who had filmed the initial attack carried on, and only ended when a bag containing his phone had been ripped from him. He was left with a fractured eye socket and corrosive burns to his eye, with doctors later describing his recovery as “miraculous”. The suspects then got into three cars and drove from the scene, shouting homophobic comments at members of the group and that they “run Hackney”. Officers reviewed the CCTV footage and were able to identify the majority of the suspects. They were assisted by the Met’s Fingerprint Bureau, which was able to confirm which suspects had been holding the white bottle containing the noxious substance. Detective Constable David Leitner, who led the investigation, said “seven violent and dangerous men have been removed from London’s streets”. He added: “The level of violence used in this attack, coupled with the speed that this incident escalated, are truly shocking. Huseyin Onel was sentenced to 17 years in prison for applying a noxious substance causing grievous bodily harm, plus an additional three years on extended licence. Onel was sentenced to nine years each for six counts of casting a noxious substance and three years for violent disorder to run concurrently. Mehmet Tekagac, 30, of Kenworthy Road, E9, was sentenced to 14-and-a-half years in prison for applying a noxious substance causing GBH, plus an additional three years on extended licence. To run concurrently, Tekagac was sentenced to eight years for robbery and three years for violent disorder. Onur Ardic, 27, of Frampton Park Road, E9, was sentenced to 14 years in prison for applying a noxious substance causing GBH plus three years on extended licence. He was also sentenced to three years for violent disorder to run concurrently. Mustafa Kiziltan, 30, of no fixed abode but from the Hackney area, was sentenced to a total of three years in prison – 27 months for violent disorder and nine months for dangerous driving. He was also sentenced to three months for failing to stop, this will run concurrently. 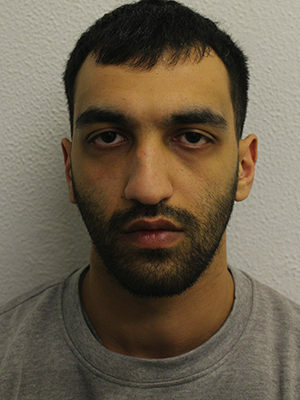 Turgut Adakan, 23, of Roman Road, E6, was sentenced to 18 months for violent disorder, suspended for two years. 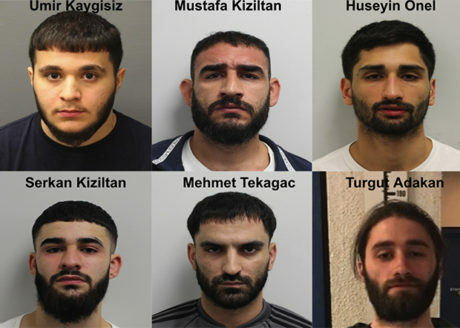 All nine were sentenced at Wood Green Crown Court on Thursday 17 January.